Range hoods exhaust fans, also known as insert liners, help maintain good air quality in your kitchen. They will also remove grease, moisture, combustion pollutants and cooking odors. It is important to note that a Range Hood is a cover, or canopy, for the vent system. A Hood Range and a Vent System are two separate pieces. Art of Range Hoods uses exclusively Trade-Wind insert products! The problem in today’s market is NOT ‘do I have enough CFM’ (cubic feet per minute) but ‘do you have TOO MUCH’? Bigger is better mentality has taken over appliance stores with large BTU (traditional units of heat) ratings producing commercial outputs that overpower residential settings. Based on their formula a 36” professional gas stove (like Miele) across 6 burners will need a 1200 CFM insert (insane!). Experts will say that you’ll only need about 600 CFM for larger cooktops while it’s more important to create proper surface coverage by overlapping the stove 2”-3” on each side and creating proper distance of 30” – 36” above your cooking area. Combine each burner by its BTU rating you would run at the same time, full power, and divide that by 100 (60,000 BTU divided by 100 equals 600 CFM). It’s important to space your cabinets accurately between the range hood for it to properly overlap the cooktop. Give an extra 6” space over the cooktops’ width for the range hood to overlap 2” and have enough clearance to install. Set the range hood 30”-36” from the cooktop for best venting results. This fluctuates based on design needs, person’s height and also fan power. Art of Range Hoods’ professionals calculate all three of these items to make sure we properly set the insert above the cooktop. The CFM count is favorably combined by appliance stores with all the burners running full power at the same time. This tells me they’re not accurately calculating or selling you the right product. If any insert performs 900-1200 CFM on 8″ or 10″ duct outlet with only two baffle filters at 30” or 36” model is going to be very loud with that amount of static pressure. There’s also not enough area or filters to pass that much air. Instead of the soft passing of air through filters, you’re going to experience noise level equivalent to a noisy McDonalds you were trying to avoid. All of Art of Range Hoods’ inserts are calculated for the most efficient performance per each duct outlet size. We then apply that towards your cooking style for the most efficient, yet quietest performance possible. Simply tell us how many burners you run full power, at the same time, daily and special occasions and we’ll show you a smart way to buy your insert! All of Art of Range Hoods’ ventilation systems use Centrifugal Squirrel Cage Motors, which are the most quiet and efficient on the market. We source our insert fans from the good people at Trade-Wind (Universal Metals). They have been our main supplier and we’re thrilled to be partnered with them. When you call to place an order for a ventilation system, we’ll determine the vent needed over the phone, then we place an order with Tradewinds on your behalf. 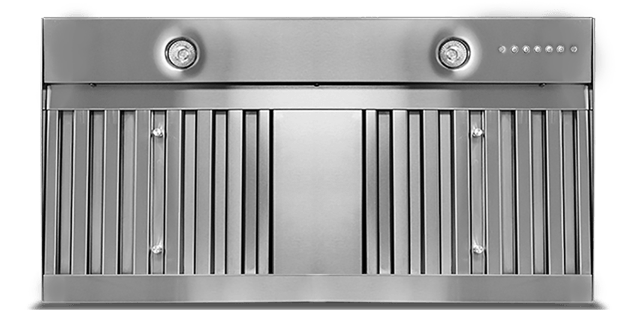 Once the insert is manufactured, it’s sent to our location in the Vancouver, WA area and we build the range hood around it. Then we build a sub-frame right in our shop so that your exact insert fits like a glove inside the range hood without a problem! Easy Range Hoods Exhaust Fans Installation Process! The insert comes with a preinstalled sub-frame built inside the range hood that will help the customer pivot the unit off the wall. Once the range hood is secured to the wall, you will have to also secure and reinforce the subframe to the wall. This will help the insert be separately hung on the wall, not depending on the copper range hood to support its weight. Browse through Art of Range Hoods amazing Range Hoods catalog. Place your order online, or call 360-891-6540 with any questions.